Just a quick one: we've been neglecting the foodstuffs because I'm on an exceedingly unsuccessful diet to get in bikini shape and I don't want to tempt myself. But I've never been to L'Atelier de Joel Robuchon in Landmark, although their cakes are little dollops of heaven, and now I want to go try these rather affordable L'Unique sets, for no other reason than that they look really pretty, and I'm superficial like that. 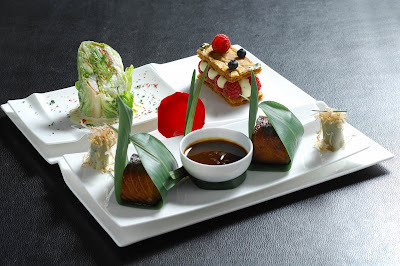 These off-peak-hour bento-inspired sets are designed as dining options for people in a rush, but since I don't sense that anyone who's in a rush goes to Robuchon for a quick bite, I feel like they'll end up being sampler platters for those who want to try the Michelin Man's food without plunking down thousands of dollars for a full dinner. There are 10 different sets at HK$268 that rotate on a time-of-day and daily basis (the press release is tres complicated) and they are available starting yesterday at the following times: 11:30am to 12:15pm; 2:00pm to 2:30pm; 6:15pm to 7:00pm; and 9:30pm to 10:30pm. 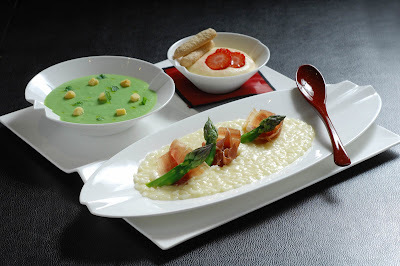 L'Atelier de Joel Robuchon is situated at Shop 401, 4/F, The Landmark, Hong Kong. Tel: 852 2166 9000.